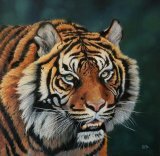 I paint wildlife in oils and occasionally, watercolour, some contemporary, some more traditional. I like capturing the texture of the fur and the expression in the eyes. I love it when people say they feel they could reach out and touch the animal I have painted. Many of the animals I paint are predators, both feared and fascinating to many and often on the endangered list. I hope you will take a look through my paintings and prints.